Hypertension is a prevalent progressive disorder and a key risk factor for cardiovascular disease, stroke, and kidney disease. Angiotensin-I-converting enzyme (ACE) inhibitors are the first-line drugs for treating hypertension, but they have many side effects. ACE is a zinc dipeptidyl carboxypeptidase that cleaves the decapeptide angiotensin-I to form the vasopressor angiotensin-II. Since the latter molecule is the main bioactive product of the renin–angiotensin system, its inhibition is a key strategy for hypertension therapy. 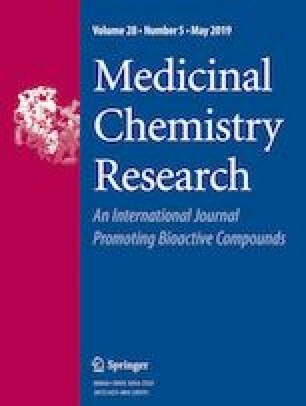 The aim of this study was to conduct an in silico evaluation of a series of new phthalamides as ACE inhibitors, examine the acute toxicity (in mice) of three of these molecules, and test the hypertensive effect of the most promising compound in a spontaneous hypertensive rat (SHR) model. The new phthalamide derivatives were synthesized with a fast, cheap, high-yield green (solventless) procedure. Three molecules (DD-01, DD-13, and DD-14S) from the current series of phthalamides were selected as the most promising ACE inhibitors based on in silico analysis of their physicochemical properties, Gibbs free energy and ADME profile. After synthesis, these three molecules showed low toxicity (LD50 > 1600 mg/kg) in the acute toxicity test (Lorke’s method). Finally, DD-01 significantly decreased systolic, diastolic, and mean arterial pressure in the SHR model, being ∼7-fold more potent than captopril (the reference drug). Three novel phthalamide derivatives were synthesized in good yields with a fast and efficient green procedure. They all displayed low toxicity. The one tested in the SHR model proved to be efficient for reducing blood pressure. The online version of this article ( https://doi.org/10.1007/s00044-019-02327-3) contains supplementary material, which is available to authorized users. EA-J is a postdoctoral fellow from CONACYT. This work was supported by PAPIIT IN223519 (to RV-M), PAPIIT IN226819 (to IAGO) DGAPA from the UNAM, by SIP (m1930 and 20194934) from the Instituto Politécnico Nacional, and by CONACYT-Mexico. We also thank MVZ L. Flores, MD. F. Barrón-Moreno, and Biol. TE Villamar-Duque from FES Iztacala, UNAM, for their aid in animal care and housing.